The spring semester is finally here, and there’s more to look forward to besides the weather. Every semester at Hollywood High school, the performing arts magnet puts on shows for students, families, and friends. There’s a dance show, choir show, and this semesters play will be “Annie”. Workshops to audition for Annie will be held from 3:30-4:00 in Ms. Goldschein’s room by the gym, and from 4:00-5:30 in Ms. Hertzner’s room by the cafeteria. The dance show will be the first show to start off the semester’s spring shows, Ms. Goldschein’s dance periods will be putting on this show and there will be three shows starting March 8, and going on until March 10. Choir will have one show on April 11, this show will be put on by Ms. Hertzner’s choir class and the Hollywood High Notes. 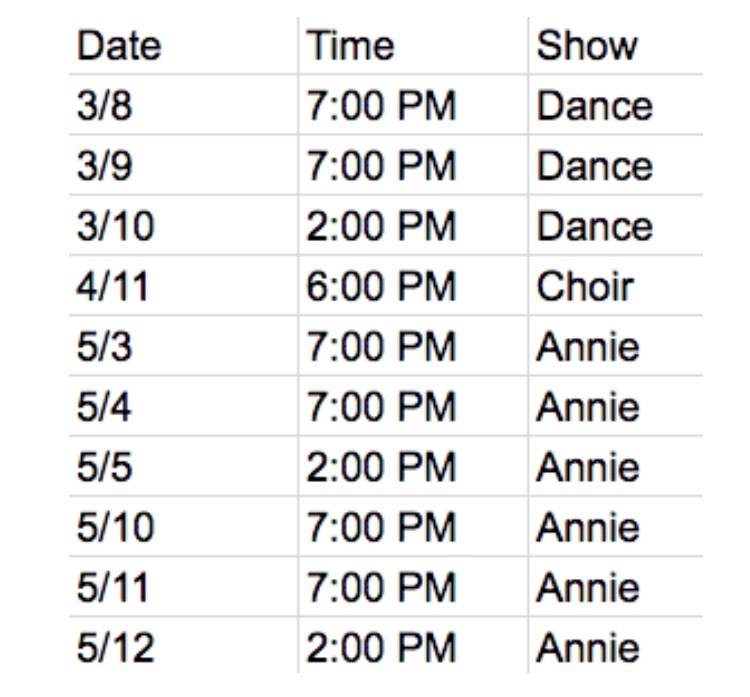 Annie will be the last show to close off the semester and there will be six shows. Go out and support your fellow classmates and teachers who work very hard to put on these shows.